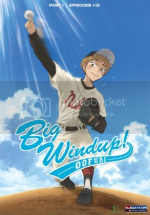 The Anime Almanac » Blog Archive » Anime Review: Big Windup! Big Windup! is the story of Mihashi, a spineless wimp of a high school baseball pitcher who nervously joins his new school’s hardball team. Back when he was in middle school, Mihashi was his team’s starting pitcher and lead his team to loss after loss. In fact, he has never won a game at his old middle school, and he’s afraid that the only reason he was their pitcher in the first place was because his grandfather was the owner of the school. Now with his self-esteem and ego seriously damaged, he goes out of his way to transfer to Nishiura high school to start over again. But when the new school’s spunky female baseball coach spots him lingering around the practice field, she forces the reluctant boy to throw a few balls to their team’s catcher, Takaya. The catcher quickly realizes that Mihashi isn’t a bad pitcher at all, he’s just been misguided and underestimated by his former teammates. Now with Takaya’s brilliant game play strategy and Mihashi’s dormant pitching ability, the brand new Nishiura high school baseball team is on their way to greatness in this fantastic first half to the 26-episode sports anime series. For me, the core of this series is in its portrayal of the game of baseball, and man, does Big Windup! execute this well! With in the first volume, you get to see one exhibition game between Mihashi’s new team against his old team. This game is spread across four straight episodes, and for the most part, you get to witness the play-by-play of the whole thing. The show very rarely skips around, and you hear the inner monologues of the pitcher, batter, and catcher before and after each pitch. The level of detail is so incredible that you’ll actually feel like you’re watching a real baseball game during these few episodes. You’ll start keeping track of the inning, the count, the batting order, and the score in your head as each episode progresses. This is a fantastic way to draw in fans of the sport and keep them interested in this fictional story. On top of this authentic game play experience is FUNimation’s fantastic English adaptation. They don’t hold back on any of the baseball jargon, so those unfamiliar with the game may find themselves at a loss over the terminology. FUNi also doesn’t hold back in the high school boy dialogue, and drops in some unique words and phrases such as “douche,” “drain the lizard,” and the occasional curse word when the team members are talking among themselves. And a conversation between two high school girls in the stands during one of the final episodes in this volume is probably the most authentic and realistic dialogue I’ve ever heard in a dubbed anime. Now, that’s not to say that this anime isn’t without its flaws. Big Windup! has had a notorious reputation for its many homosexual undertones among the team members. I really don’t think that most male high school athletes would go along with bonding exercises that involve holding hands and talking about their feelings with each other. While I didn’t really think it was too distracting from the series, it will most certainly generate some snickers from the peanut gallery. I also wasn’t too impressed by the look and design of the series. Most of the characters appear to share the exact same face and hair style. They seem to spend about 90% of the time blushing, and when Mihashi goes into a comedic nervous expression, his face ends up looking like a cross between a cat and a lizard. But even with those flaws. I just loved this series and it had me in hook, line, and sinker. It was always a surprise every time the ending credits came up because the episode passed by so quickly. Likewise, I was also glad every time a new episode started because I kept on wanting to watch more! The Good: Fantastic English adaptation with authentic dialogue and baseball jargon. High level of detail in game play makes you feel like you’re actually watching a baseball game. The Bad: Facial expressions a little too goofy at times. Homosexual undertones may draw out some snickers. Final Verdict: Big Windup! is an exciting Japanese anime about America’s favorite past time. I loved it and can highly recommend it for fans of the sport. This entry was posted on Wednesday, August 19th, 2009 at 11:52 am by Scott	.